Merry Christmas to all- I hope Santa's work is nearly done and it’s now time for the holiday parties to begin! I am a little more than 800 miles West of Cape Town, SA and steaming that direction at 11 knots in yet another 30K breeze. ETA Monday Dec. 29th. It has been a trying 72 hours and I am a bit exhausted for sure- but I feel good about the game plan to head to Cape Town and get the hydro system fixed and working properly before heading into the Southern Ocean. My pals Brian Harris and Josh Hall have got me set up for an excellent welcome in Cape Town and I hope to get the repair completed and be in and out of there in less than 24 hours. 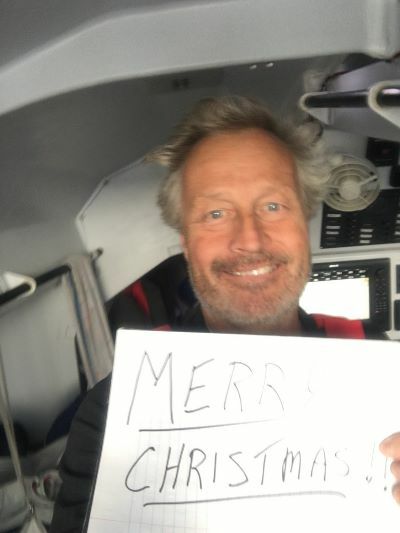 My goals remain: 1) Sail solo around the world and return home safely and 2) Continue the attempt to beat the record of 137 days, despite the Cape Town pit stop- and "unofficial" status. Who knows what will happen from here? It has been a wild ride thus far and I have no doubt it will continue to be.